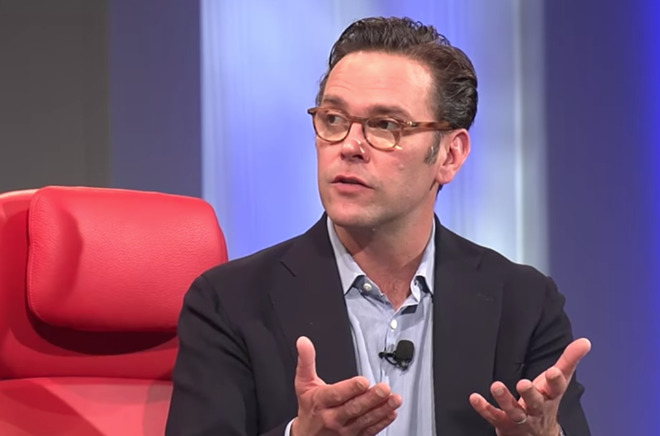 Apple's efforts to produce original video content could be grander in scale, according to 21st Century Fox CEO James Murdoch, suggesting the slower pace of commissions may not have as big an impact as competitors like Netflix. When asked for the kind of advice he would provide non-media companies entering the industry, Murdoch highlighted the need to encourage creativity from producers. Speaking at Recode's Code conference, he noted that this should be done at scale, and to accept not every project will be successful. "Managing a creative business is quiet challenging," he said. "I don't think it's that different. I think every part of every business, every great business, is creative." Speaking from his experience at 21st Century Fox, Murdoch adds that to understand how to manage a creative business, there also needs to be an understanding of the "diversity of output you'll be required to have and to encourage," and in his case, being entrepreneurial in his approach. Part of empowering creators and encouraging them to push the envelope also means having to embrace when projects go wrong, with the CEO admitting "We often fail, and I think being tolerant of failure is important." Using Apple as an example of where companies are "dabbling" in the market, Murdoch notes Apple's approach leaves little room for failure. "If you look at Apple, going piece by piece, one by one, show by show, etcetera, is going to take a long time to really move the dial and have something mega." Producing to scale is a massive challenge, Murdoch acknowledges, but then turns to Netflix as an example of a massive investor in content. Netflix's expenditure on original content is being made "in anticipation of potentially their not being able to acquire rights from outside programmers," with Murdoch calling the strategy one involving "enormous bets." During South by Southwest in March, Apple SVP of Internet Software and Services Eddy Cue advised of Apple's strategy to produce fewer shows is intentional, stressing the need for quality over quantity. "We want things that are of great quality," said Cue. "That doesn't mean everything will be a hit, but everything should be very very high quality, and I think that's where we will stand out." Apple's video production efforts are by no means minimal, as Apple is believed to have a $1 billion war chest dedicated to original content, with a report from last year suggesting the investment can grow far beyond that figure over the next few years. By comparison, Netflix reportedly has plans to spend up to $8 billion on content in 2018 alone. Current notable Apple production deals including a revival of Amblin Television's sci-fi anthology series "Amazing Stories," an animated musical series from the creator of "Bob's Burgers," and a drama starring Reese Witherspoon and Jennifer Aniston. The total number of projects is believed to be in excess of 12, including nine "straight-to-series" orders without a pilot, with the first batch of shows from the effort potentially arriving in early 2019. Apple has also reportedly signed a lease for a building in Culver City, Ca., which is speculated to become the company's content-related headquarters. Opening in 2019, the building includes 128,000 square feet of office space across four stories, minutes away from another 85,000-square-foot facility that has been linked to Apple since last year. 21st Century Fox is currently the subject of two acquisition offers, from Disney and Comcast. The $52.4 billion Walt Disney Co. deal, which involves Fox's entertainment properties and assets round the world, is currently awaiting regulatory approval, while Comcast is believed to be preparing a separate all-cash offer worth $60 billion in a separate bid.